Construction on the Lower Don should be finished in a few months, but more work is needed to make Toronto's ravines accessible for residents. The author and his daughter exploring the Lower Don Trail. Photo by Courtney Walker and used courtesy of Andrew Reeves. We watched from the Don River overpass. An older cyclist slowed as he approached a blue metal gate blocking the Lower Don path. My daughter and I had just emerged from a monotonous stretch of trail following the river like a ruler’s edge from Queen Street to Riverdale Park. North of there, the trail was closed, according to a scratched and spray-painted placard from the city. Undeterred, the cyclist moved towards the bank of the Don and contorted his body around the fencing, wheeling his bike around as the back tire hung briefly above the river. We watched as he plopped the bike on the trial, mounted, and sped away into the construction zone. That was May 2016. I had just begun a stretch at home with my four-month-old. Desperate for long walks to keep her asleep, I often turned to the Lower Don. I gravitate towards water, and it was close to home. The Lower Don trail stretching from Corktown Common to Pottery Road and beyond had closed the previous September for what the city had promised was a year-long delay. The end result would be a new pedestrian bridge at Pottery Road, a revitalized underpass beneath a defunct rail line and trail repairs to contend with ceaseless tree roots upending the concrete. Anyone who’s walked or biked the Lower Don knows these repairs are badly needed. Crossing Pottery Road during rush hour was like playing a high-stakes, live-action game of Frogger, while the near-90-degree turn needed to get through the narrow, corrugated metal tube that was the Belleville Underpass either brought traffic to a standstill or resulted in heart-stopping close calls as cyclists swerved to avoid each other in the confined space. We returned to the Lower Don in April. My daughter can walk now. She can feed herself (sort of), recite lines from her favourite books, and knows to run away from me when she doesn’t want her diaper changed. I’ve been walking the Lower Don with her since before she could do these things, and I wonder what new skills she’ll acquire before it opens. As we approached the same overpass where we witnessed the cyclist casually disregard city fencing, I stopped and looked down. The fence was still there, still warped from abuse, still allowing frustrated residents to pass through, almost a year after officials said it would be gone. Sunny days and warmth are finally muscling out our sweater-weather spring. 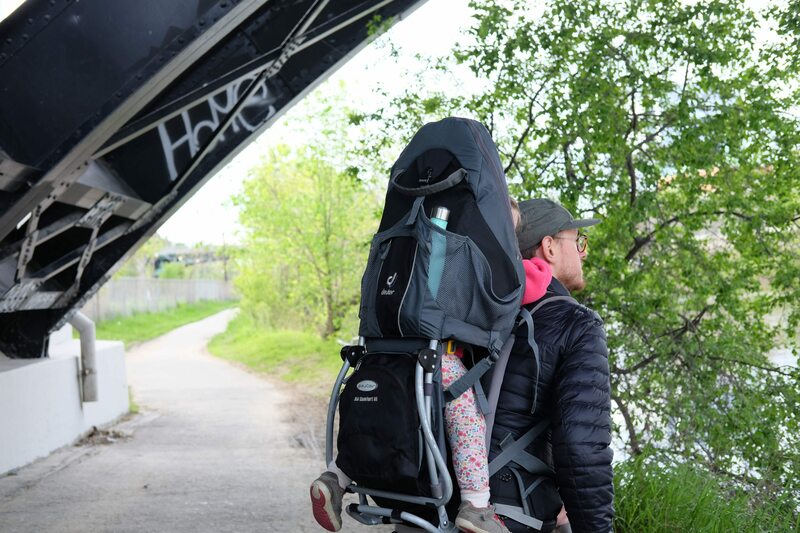 So in anticipation of the countless joggers and cyclists and strollers about to descend on the Lower Don, it was time to ask the City: What gives? I called up Matthew Cutler, public relations head for the department of parks, forestry and recreation. The Lower Don will be closed until July 2017, he told me. Delays at Pottery Road and the Belleville Underpass came from the unexpected challenges from working alongside rail lines. “Both the bridge and the underpass directly intersect with the rail corridor,” Cutler said. The Pottery Road bridge is fully installed, yet there’s no connection to the trail on account of stringent Metrolinx guidelines. While the track running beside and over the Lower Don trail isn’t active, Cutler said, Metrolinx insists that their rail lines be considered live at all times. “We have had to build the underpass as though tomorrow trains will run on top of it,” he said. 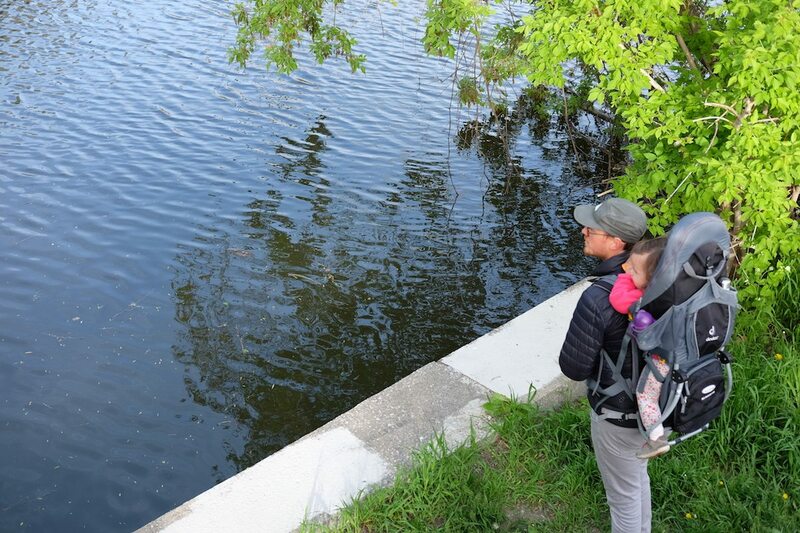 The author and his daughter walk along the Don River. Photo by Courtney Walker and used courtesy of Andrew Reeves. Unearthed relics also set the project back. When excavation began on the underpass, workers discovered foundations from a previous culvert at the same site, pieces of metal and wood so big they couldn’t be worked around. “We didn’t expect that,” Cutler said. The new find necessitated a full re-engineering of the underpass, which meant lengthy delays. City residents haven’t helped matters. “There’s been a lot of vandalism…throughout the process,” Cutler said. Signage for the trail closure has been graffitied over to the point of illegibility. That twisted blue metal gate we witnessed cyclists and pedestrians squeeze past? Cutler recalled getting phone calls from several locals happy that the work was done and the trail open. “That wasn’t the case,” he said. Some frustrated resident had simply torn it down. The repairs are part of a broader blueprint for revitalizing the Lower Don as a recreational system. In 2012, City Council commissioned urban design firm DTAH to study ways of connecting Torontonians with the river. They tabled their master plan in late 2013, spelling out the central question facing parks department planners as the city booms: How can you design natural amenities like the Don Valley for more urban residents while simultaneously protecting what pockets of natural environment remain? There’s no simple answer, yet the report is a comprehensive plan for reimagining the Lower Don. Crucially, increasing the trail’s deplorably small number of access points takes centre stage. Staircases and walkways at Dundas and Gerrard streets and the Bayview on-ramp will help people get to widened pathways leading to picnic areas and observation points. When it’s ready, the Belleville Underpass will also offer a much more pleasant user experience. The turn will be gradual and the sight lines better, accented by landscaping and public art. Council has put up $18 million. 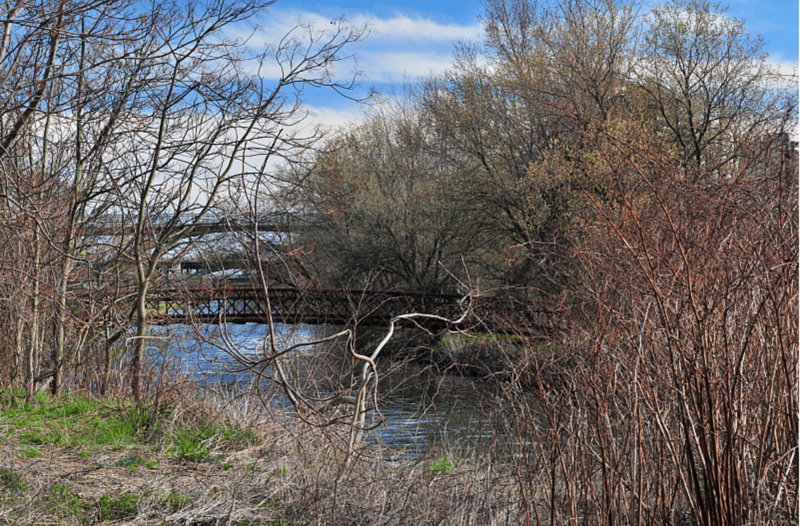 The Lower Don Valley in the spring. Photo by Tania A. in the Torontoist Flickr Pool. But the Pottery Road bridge and Belleville Underpass are just two pieces of the master plan. Torontonians could face years of extended trail closures as the plan is implemented from Taylor Creek to Corktown Commons. “We can’t have one-off projects in a space this small,” Cutler said. “Over the next 10 years, the trail could be closed more often than it’s open if we take these projects one at a time.” Effective capital coordination of future projects is essential. While the extended shutdown of the Lower Don has been brutal for those relying on the Don River for recreational green space, the project and its frustrations have taught the City a lesson. “It’s helped us to refocus our energies on the rest of the Master Plan,” Cutler said, to figure out minimizing closures and maximizing public use of the space. This story has been updated with the correct link for the master plan. June 1, 2017, 12:40 p.m.